Memorial Day is a day of remembrance, and many families choose to celebrate with a barbecue. Hosting the perfect BBQ is all about embracing the theme in your planning. That way, you can participate in a meaningful celebration without having to stress about the party. Choose a theme for your Memorial Day celebration that will help dictate the decorations, menu and activities for the barbeque. The typical Memorial Day celebration is patriotic in nature. Use American flags and red, white and blue decorations to make your party location festive. Honor the military men and women in your family and circle of friends by having a miliary theme. Set framed photos of family or friends who are currently enlisted members of the armed services or veterans on tables as centerpieces. Have a moment of silence to remember those who have lost their lives for our freedom before eating the meal. Memorial Day is the perfect time for a family reunion. Set a copy of the family tree on an easel for guests to view. Create a family photo slideshow on a laptop to help guests reminisce. Take theme inspiration from the barbeque grill itself. Have a "grill-off" contest between the top grill masters in the family. 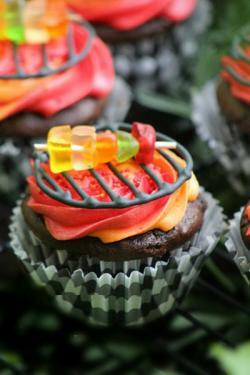 Serve chocolate cupcakes with "fire" frosting (red, orange and yellow swirl), a royal icing grill and candy kabob. FrugalMomEh.com has detailed instructions on how to make this fun dessert. Almost everyone loves a day at the beach. Host your Memorial Day BBQ at the local beach and enjoy some fun in the sun. Build sand castles or play a little volleyball. Send invitations to guests well in advance so they can have time to plan to attend your barbeque. Pre-printed - Buy some pre-printed invitations and fill in the party details before mailing to the guests. Online - Use an online service such as Evite to send and manage invitations. Customizable - If you want to customize your invitations, you can choose the style you like and add your party details to any of these designs before ordering a printed version. Since barbecues are held outdoors, minimal decorations are required as the beauty of the natural setting is often enough. If you are going to host your barbecue in your own backyard, you can be more elaborate with your decorations. If you are hosting the party in a public park, you will be more limited on your decorations. Here are some ideas that can be adapted to any venue. 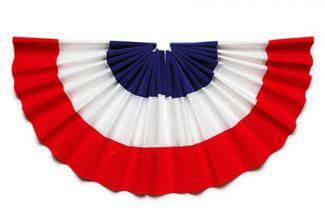 Bunting - Add red, white and blue bunting to a fence or around the edge of tables to create a patriotic look. Balloons - Fill patriotic-themed balloons with helium and tie them to the backs of chairs or onto flower pots to help create a festive feel. Table Ware - Cover tables with red, white or blue table cloths and use matching plates, cups and napkins. You could also use patriotic-themed plates, such as these seven inch flag plates. Centerpieces - Use patriotic pails as centerpieces. Fill them with red, white and blue candies or simple white flowers. Traditional barbecue foods are perfect for a Memorial Day celebration. 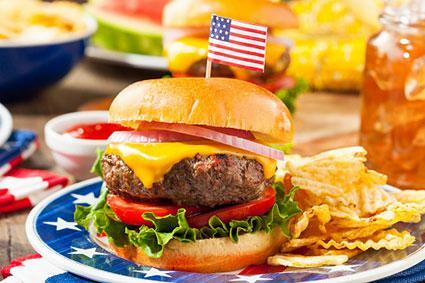 Serve food in red, white and blue serving dishes and add small American flag toothpicks to some of your food for decorations. 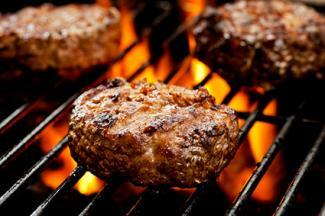 Grilled Hamburgers - Be sure to grill your hamburgers enough so they are safe to eat, but not burnt. Barbeque chicken - Offer chicken as an alternative to other meat options. Grilled Shrimp Kabobs - If shrimp is a favorite amongst your circle of friends, try these delicious grilled shrimp kabobs. Pulled pork - Provide traditional slider buns, healthier wheat or yummy onion with the pulled pork, topped with BBQ sauce. Baked beans - Baked beans are a favorite for many barbeque goers. Potato salad - Potato salad is a staple of the American BBQ and picnic. Grilled vegetables - Use aluminum foil to grill some yummy vegetables. Summer Punch - Quench guests' thirst with a refreshing punch or consider bottled water instead. Patriotic Cookies - Use this recipe for delicious cookies or simply buy plain sugar cookies and allow guests to frost and decorate their own. Also try some other patriotic food choices that have a red, white and blue theme. Spend time creating thoughtful care packages for the troops. Operation We Are Here offers ideas and suggestions for creating these gifts for deserving troops and veterans. Make your own ring toss. Paint white paper plates red and blue (and leave one or two white) before cutting the center out of them to create a ring. Push posts, such as dowel sticks, into the ground to create a patriotic ring toss. Provide a fun craft for all your guests, particularly the little ones. 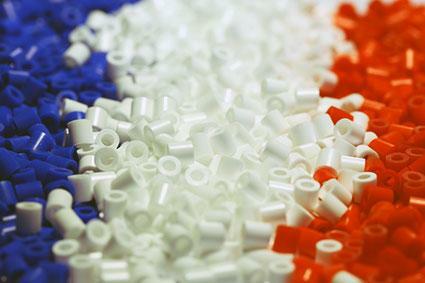 Use red, white and blue pony beads and pipe cleaners to create bracelets. Another option is to make homemade cards to send to military troops. Set up a photo booth. Hang a flag against a fence or from a tree to create a background. Provide guests with photo booth props to help them create fun photos and memories. The most important part of any Memorial Day celebration is to remember loved ones who have passed away, celebrate those who are close to you and to create new memories with those you love. Don't stress over small details, and keep things simple so all the guests can enjoy quality time with each other.